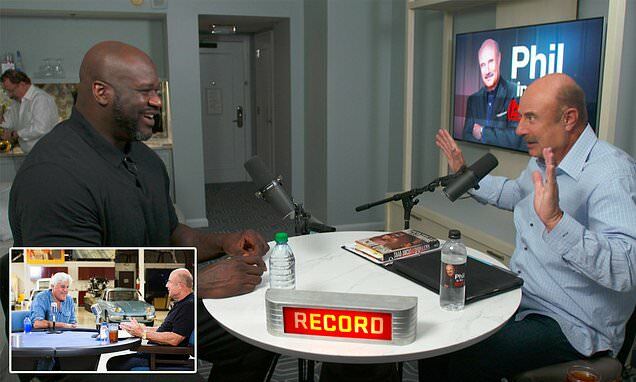 Dr. Phil McGraw is diving into the world of podcasting with his highly anticipated show Phil in the Blanks airing Tuesday with his first guest, Shaquille O'Neal, helping him kick off the series. Dr. Phil tells DailyMail.com that he is excited to work in the time-restraint-free medium of podcasts, which will allow him to dive deep in his interviews with some of the biggest newsmakers of our time. The television icon says he will be speaking with a wide array of influential people from Jay Leno, Charles Barkley, Kathy Bates, Dax Shepard, Steve Harvey and many more, and he will be interviewing them with a focus on their personal paths to success. 'This is different because I'm not solving problems. I am talking to really interesting people doing really interesting things,' Dr. Phil says of his podcast. Dr. Phil, who is renowned for his ability to pull important and often guarded information out of people, is bringing his interviewing techniques to the forefront in Phil in the Blanks, as he tackles the tougher questions. 'I am talking to them in a way that no one is talking to them anymore,' he says of his influential guests. With Shaq, Dr. Phil stayed away from the general basketball questions, and was able to get the NBA star and sportscaster to speak on some really hard line issues he faced growing up to eventually becoming one of the greatest players, ever.